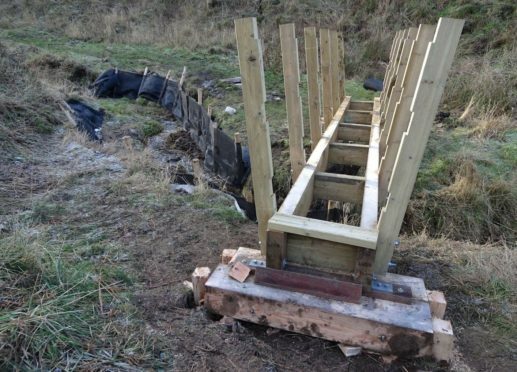 Footbridges on a scenic north-east path are being rebuilt after being damaged by Storm Frank. Works on the bridges along Gardenstown from the beach to St John’s Kirkyard will ensure the routes are safe. Both the path and the footbridges leading to the kirkyard are vulnerable to extreme weather and flooding. The land the pathway runs through is privately owned, so Aberdeenshire Council has teamed up with the landowner to maintain the path. Andy Sturdy, King Edward and Gamrie Community Council member and secretary of the Gardenstown Village Action Committee, is delighted to see work started. He said: “The footbridges are on the walk from the Gardenstown Seatown beach up to St John’s Kirkyard. “New bridges are currently being constructed by Aberdeenshire Council’s contractor as the council is responsible for this walk. Over the years in the area there have been a number of new paths constructed using European Funding, with farmers obtaining grants and organising the work. One of those is the route at Troup Head, called Downie Bay, which links into the RSPB reserve there. Mr Sturdy said: “It will be great addition for tourism during the nesting season. “Also we now have a splendid walk along the cliffs from Gardenstown to Crovie, which allows either a circular walk linking with the traditional walk along the shore and past The Sneuk, or connects onto another recent walk from Crovie to Bracoden School. Councillor Andy Kille, who lives in Gardenstown, added: “I’m very pleased to see this work taking place. An Aberdeenshire Council spokeswoman said the project would continue as required. She said: “The footpath was significantly damaged as a result of extreme weather, including Storm Frank and other subsequent events. “The current work is focusing on repairing the bridges, there are no current plans for works to the footpath and we will cooperate with the landowner if required.